The Great Food Truck Race 3 should be over today. I do not know who won, but I will extend a hearty “congratulations” to Nonna from NJ and Seoul from LA. They outlasted 6 other teams, and had great support from new and old fans. One thing I noticed from this season (compared to my participation in season 2) was a lot of below the belt comments, and breaking of rules from the fans as well as from the eliminated food trucks. Last season, my opponent from Hodge and I had a healthy twitter competition. We never put down the other team. In fact, we even worked together, by tweeting locations at various cities, to convince foodies to eat from our 2 trucks. Our alliance worked all the way to the final 2… when we had our show down in Miami. By the time the taping of season 3 was over, fair play was thrown out the window. There were breaking of rules by food trucks: Under the Crust and Coast of Atlanta. Under the Crust and Coast of Atlanta openly tweeted their support for Seoul Sausage. 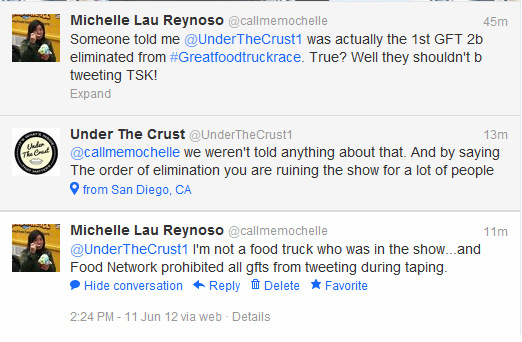 The rules of the GFTR is the trucks can not use social media about the competition. Even after confronted, Under the Crust refused to stop tweeting during the Race, even went so far as to block me from spying on their tweet. I also found distasteful and disrespectful when an opponent makes suggestions that a pretty face, and not their food, is the only reason they made it to the finale. I hope next season the fans will learn to play nice. As Dragnet would say.. just the facts, ma’am.